Two Drink Minimum #11 – SimCity?! And Xbone! Two Drink Minimum #10 – E3 Edition! This week’s game: Mega Man 8: Anniversary Edition! Two Drink Minimum #9 – Kickstarter and Studies! This week’s game: Gex: Enter the Gecko! Two Drink Minimum #8 – Not All EA News is Bad News! This week’s game: Super Mario World! Announcement: Stream moved to Thursdays! Since it’s Spring and soon will be Summer, this week we’re switching back to our Thursday night schedule. The stream will still be on at 8pm EST but Thursday instead of Saturday. We’ll still record the show and post it afterwards. Pow! For those who are looking for pictures, especially the cosplayers, the pictures are in the works! 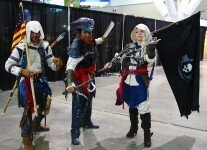 Thursday through Saturday, all of the cosplayer pictures will be up, along with the majority, if not all, of the rest of the pictures from PAX East. Check back during the week and thanks!